You may want a tranquil peaceful garden but sometimes you need some supplementary relaxation. After your toils to achieve a neat restful space you can reward yourself with some gentle music. The National Trust recognise this and have launched a CD collection of ‘Music for Tired Gardeners’. Relax after a hard days gardening to the music of Vaughn Williams’ Greensleeves, or if the weather in inclement Chopin’s Raindrop prelude may refresh you. Other composers on the CD include Tchaikovsky, Delius, Debussy, Schumann and Eric Coates etc. You may not be ‘In a Monastery Garden’ but the Delius operatic composition ‘The Walk to the Paradise Garden’ will be some compensation. Walking around your garden you can sign the old traditional song ‘How many kinds of sweet flowers grow In an English country garden? Sorry the title may be a bit misleading if you were thinking of citrus fruit (not something I try to grow). This is one of my prized Acer Palmatums that cost me all of 10 pence when our local garden center was closing down some years ago. I believe this mini tree is called ‘Orange Dream’ but the ticket was missing still what can I expect for the price. 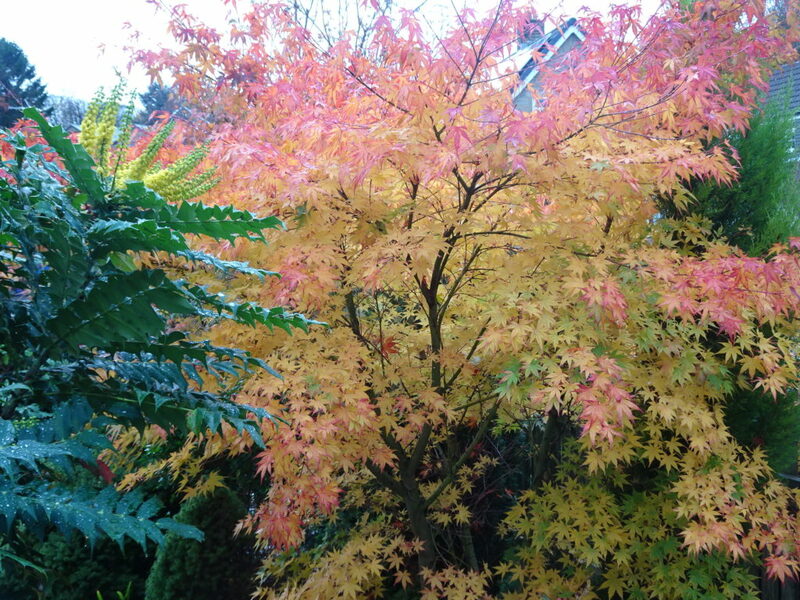 Luckily it was one on several varieties of Acer whose leave turn a brilliant orange, lemon or red in autumn. Well worth giving them a space in your garden. 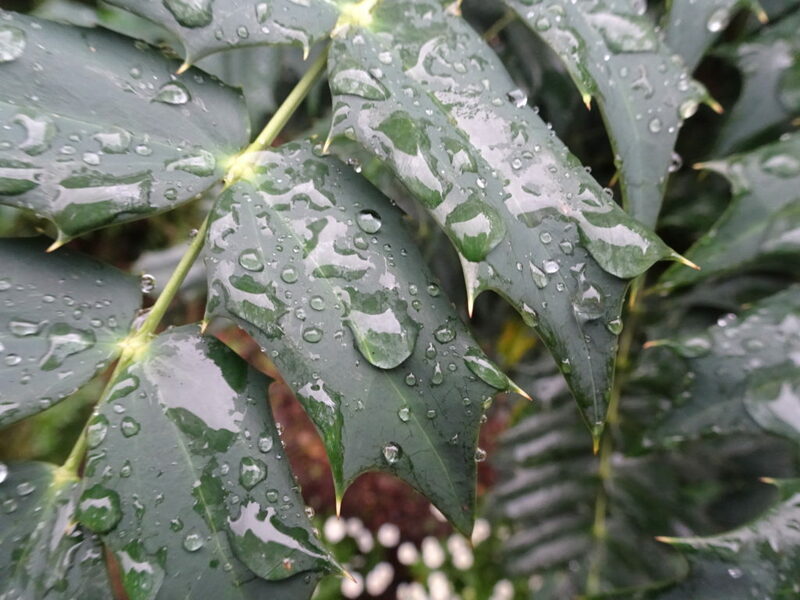 I have been a bit short of things to say since Christmas but I recently got the camera out to snap the rain on my favourite Mahonia. Growing in some shelter by a golden conifer this mahonia doesn’t suffer from any wind. The shrub has grown dramatically over the last few years. In late summer I lopped four feet off the top and trimmed the side shoots that were taking too much space. Now a respectable six feet tall I am getting good flowers that are still a bit too high to get my nose into. 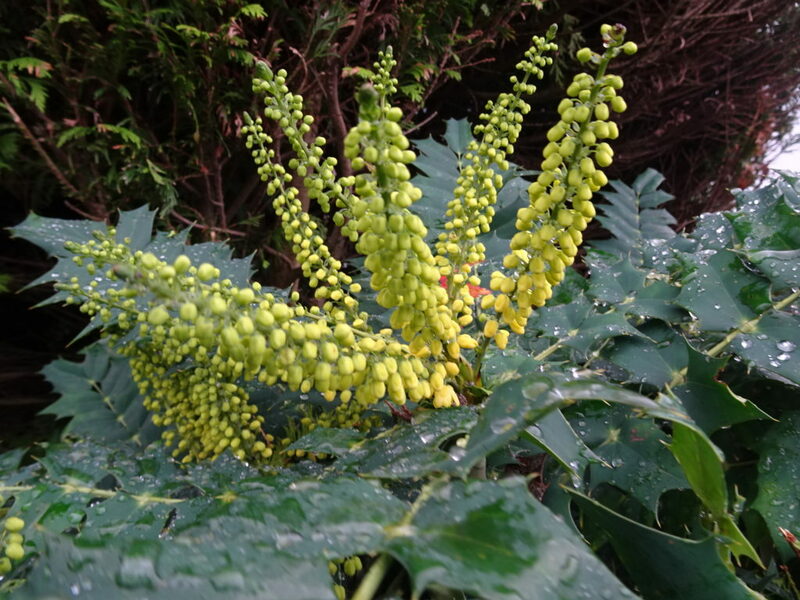 I have two other lower growing mahonia growing in acidic soil with other ericaceous plants. The prickly side shoots no longer reach over the path. It is possible to enjoy gardening without having a traditional garden. Budding new gardeners can get a lot of pleasure and experience from a simple approach to plants and growing. Children can learn from growing mustard and cress from a packet of seeds in the kitchen. Put some cotton wool in half a clean eggshell dampen and sow some seeds. Better still may be a saucer with a damp face cloth. A bean or pea seed in a jam jar wedged against the glass with some blotting paper will grow a root and a shoot to demonstrate the wonders of nature. Pot plants are often an introduction to gardening. Indoor they need light and water but most can survive at least 6 months without feeding. Green leaved plants may be easier to keep alive than flowering plants which in my experience need more care and attention. Without a traditional garden you can use grow bags on a balcony or path. I fill some bags and containers with bulbs or young, ready grown plants. Windowsill in my house are chock-a-block with plants from herbs and salad to exotic orchids. Even new gardeners can give some of these a go. If all else fails new gardeners can visit parks & gardens, garden centers and even look around the hedgerows and neighborhoods to get gardening knowledge and experience. A well maintained green sward with stripes from a lawnmower is the epitome of a British garden. It could be something to do with the amount of rain we get but it also depends on the type and care of the grass. High quality grass (HQG) seed mixtures containing fine bent grass and fine fescue grass seed are for top class grass but can be high maintenance. General purpose grass seed contain a mixture in varying proportions of HQG seed plus smooth stalked meadow grass and timothy. Hard wearing grass similar to that used for football pitches and children heavy use grass also include quick growing perennial ryegrass. In new gardens I have often resorted to buying turves. Turf is best laid in autumn. Stagger the turf like a brick wall and stand on a plank as you lay the turf. 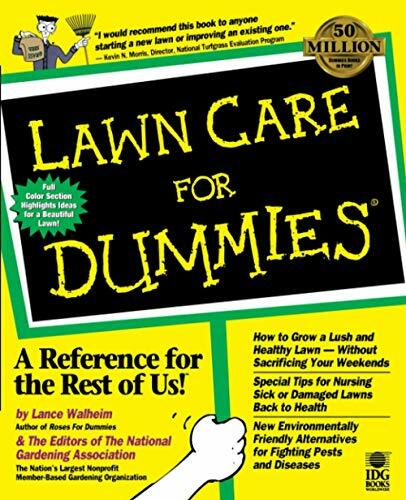 The secret of a great lawn is in the preparation. Dig over, remove weeds, firm down with your heels, rake over and firm down again, collect any stones and rake to get a fine tilth into which you can sow your seed. Trim the edges and keep them that way for a tidy appearance. Some plants want to grow their own way without human intervention. It is a gardeners job to try get the best result by growing for crop quality, size of floral display. Knowing what you aim for will help you decide how to train your plants to do what you want not what nature will allow to happen. A good example is a tomato plant that will continue to grow taller and produce more leaf and less tomatoes if left to its own devices. So tomato plants are ‘stopped’ when the plant has 5 – 7 flower trusses so the energy goes in to producing fruit not leaves. Nip out the growing tip two leaves above the last flowering truss. As tomatoes try to throw side shoots at every opportunity these also need ‘pinching out’ before they sap energy. This is similar to stopping but nipping the side growth with finger and thumb. Bush tomatoes can carry more side shoots but I still constrain mine and it is fatal to allow cordon varieties to run amok. Many ornamental plants benefit from restricting the number of flowers by pinching our excess buds. HT Roses, Chrysanthemums and Dahlias that have groups of buds together are among those I dis-bud. Dis-budding works well on apples and fruit trees as well. Instead of a clutch of small fruitlets take off all but one of a cluster and let the remainder grow larger. Deadheading plants will often encourage another flush of flowers. Once plants set seed they think it is all over but cutting off old flowers delays reproduction of seed. Try this on sweet peas. New gardeners are keen to get going and it may be painful to wait for several months to grow your own from seed or cuttings. Fortunately there are several ways to shortcut the process by buying starter plants. Plug plants are available from mail order seed merchants and local garden centers. These plugs are plants grown for gardeners to ‘grow on’ (ie allow to develop in a bigger pot for a while) or to harden off and plant out. Check the instructions that generally come with the plugs. Jumbo plugs are what they say in the name. More compost and bigger plants at a bigger price but I buy these for special perennials or quicker colour displays. Early in the spring you can find small individual seeded pots sown densely then germinated so the seedlings can be pricking out and grown on. Bigger seeds are often available in a nest of 4,6 or more black plastic pots. I buy special tomato varieties and some vegetables this way. 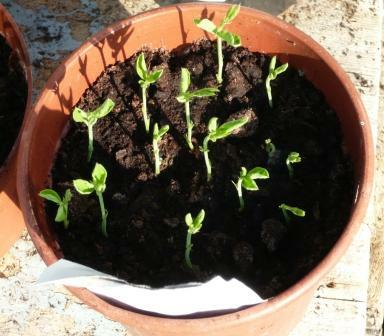 Local market stalls and nurseries will sell plants in individual pots. This can give you a quick start but take care. Plants should look right ( not be drawn and thin) and pots should be an appropriate size for the plant with no roots growing out of the holes in the base or weeds on the surface. To some soil is a brown mess to make mud pies from for others it is a crusty, cracked, rock hard piece of the garden that takes effort to cultivate into good soil. Mixing in more sand will help both these conditions. Soil that is too sandy will drain through very quickly. Good soil contains clay, sand and silt in varying proportions. A preponderance of clay is called a heavy soil and can lead to the crust or a ‘pan’ referred to above. Air and water are the other crucial components of soil. They give and maintain life for all plants and other life forms. Dissolved nutrients and decomposing plant matter (humus) provides food for the numerous creatures that make their home in the soil. Millions of microbes (fungus & bacteria) are present in good soil and their beneficial effect is just beginning to be fully recognised. Worms help aerate the soil and maintain a balance structure. Other creatures help compost dying plant matter. 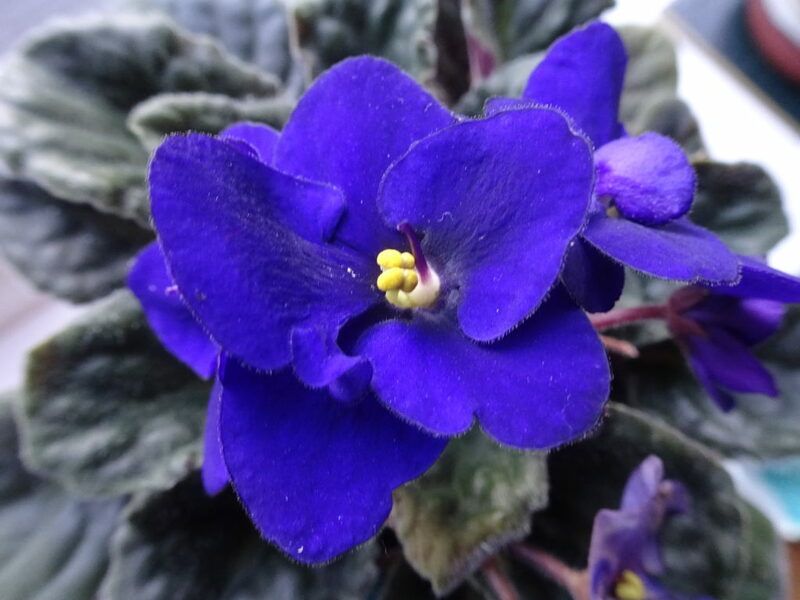 In this series of ‘fives for New Gardeners’ I have limited the number of photographs I have included but I am proud that I grew this African Violet from a leaf rooted in water. Gardening includes a bit of pride so I am happy enough for now. 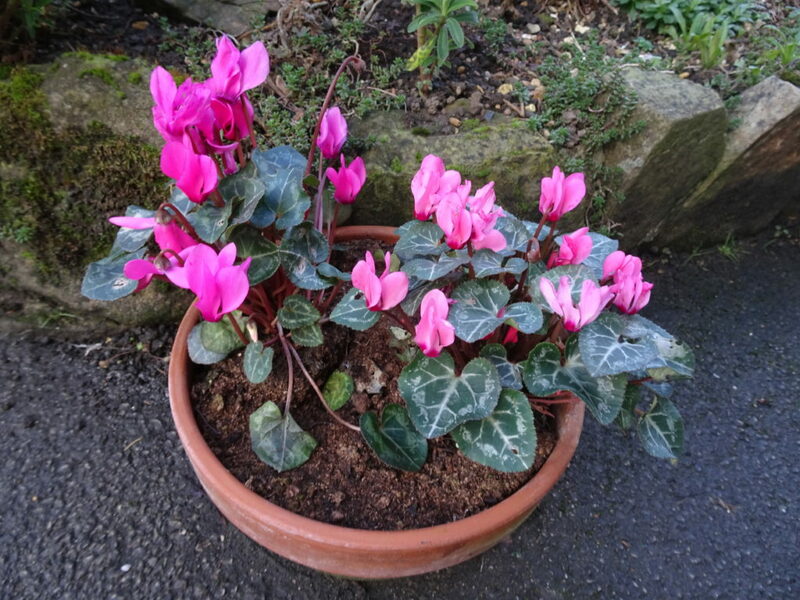 Cyclamen have been bred to last well on a windowsill and the various sizes and colours are now worth seeking out. Look for the less garden hardy Persian varieties for the exotic look. Not always thought of as a windowsill plant I like the geranium or Pelargonium which my mother used to grow in great number on a window ledge. I have just ordered some gloxinia corms to try growing by my windows this year. I have do OK in the past but want to do better this year. Back to my current favourite the African Violet. If you have a safe watering regime the plants will reflower several time during the next 12 months and are available in a range of colour shades. I also like the furry texture to the leaves. Beware collecting windowsill plants can become addictive. I have a dozen plants on the windowsill in the study come spare bedroom right now! What will I do when new seedlings need the same space? Bulbs are commonly understood as plant storage devices and here the term bulb is used to cover various forms of dormant plants. Underground plant storage is provided by nature in various forms examples of which include corms for crocus, bulbs for daffoilils, tubers for Dahlia or rhizomes for Lily of the valley. A top performer in summer is often one of the many varieties of Lily. 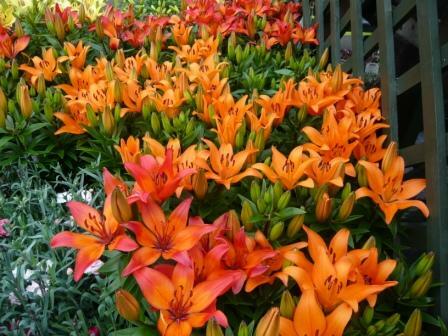 The Asiatic lily can grow in tubs on the patio to 12″ high. Larger double flowered lilys can be over 3′ tall. Dahlia tubers are easy to grow and provide masses of flower from late summer until the first frost. Decorative, pompom, single and cactus Dahlia varieties refer to the petals and flower shape. Begonias are brash flowering corms that are progressively being used as border plants. They need lifting to regrow the following year. Crocosmia is a hardy corm that produces a spray containing many red or orange flowers along its stem. As a further thought, where would Barry Humphries have been without his famous corm The Gladioli?